I met Sarah through the rescue community many years ago. She actually ended up adopting one of our most difficult foster girls named Hope. Over the years of dedicating countless hours for the animals, Sarah became certified in dog massage. I started using Sarah for my old girl Mei Mei, due to her tight hips and joints. I slowly added Shogun, who is getting older and active in dog sports, to help with his stiff joints, just like I need massage for my old joints. Releasing my tight muscles is something I need for a healthy state of mind, and I think our dogs need it as well. 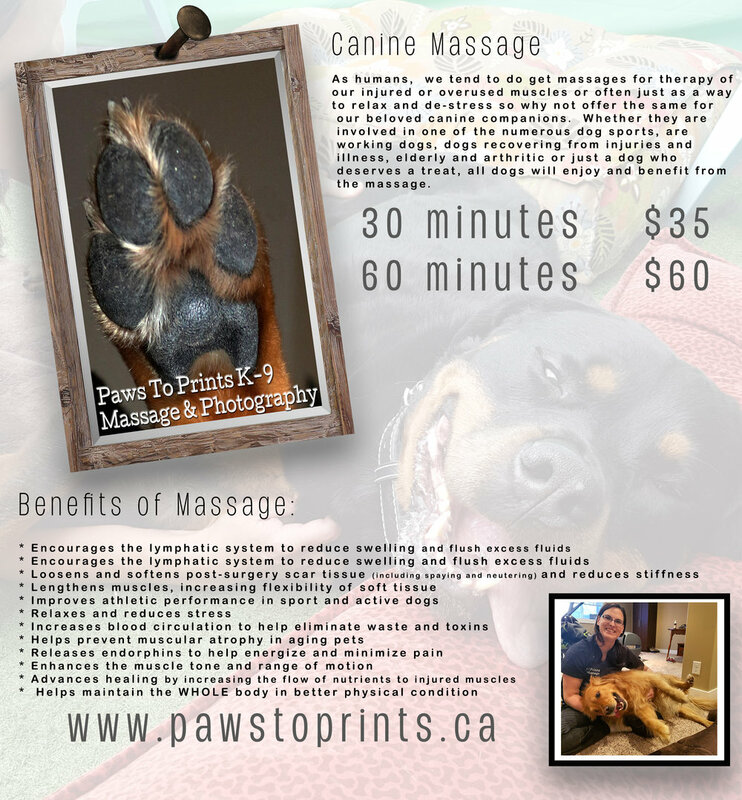 "Canine massage is something that I feel is extremely beneficial to our dog companions. It may not be hugely popular but it has been used for years by veterinarians, granted more in the horse realm, but also in working dogs. Over the years our need to put dogs to work has lessened overall, but we also have them doing more activities than before. We have dock diving, flyball, heavy pull, agility, tracking and herding, etc Massage keeps the muscles loose and helps to prevent injuries. Being an avid animal rescuer, I also see the mental benefits it can provide. Massage can help the distrusting animal learn that touch is not to be feared. It can help an anxious dog relax. It can be a source of comfort when recovering from a surgery (such as spay/neuter) and also dogs recovering from things such as mange. A gentle massage helps circulation and may help promote the regrowth of hair. I personally love massages, it helps with my Raynauds and arthritis. Back when I was sport active( Rugby) it helped immensely to soothe the numerous injured muscles. After all the physical benefits, I find that massage helps me the most mentally. For that 1 hour I can just lie there and gives my mind a chance to wind down. Why wouldn't I want that for my dogs? By no means do I think its a substitute for veterinary care and would not be comfortable even approaching that thought, but it is complimentary. Keeping a body well maintained and muscles and joints moving fluidly results in a happier being overall. I want the dogs to be just as happy as the humans because they deserve nothing less."